If you are unhappy with your smile, it’s important to know you are not alone. For many people, broken, chipped, stained, and misshapen teeth are a reality– And, many of those people live with such problems because they don’t know that simple solutions are available for improving their smile. When you feel and look good, your self esteem improves significantly. You’re able to interact confidently with business associates, friends, and family. Our professional cosmetic dentistry services can help you to get the beautiful smile you have always dreamed of having. Cosmetic dentistry advances now mean that you no longer simply have to live with a smile you hate. Numerous dental procedures are available to repair broken, stained, misshapen, and crooked teeth, delivering a self-confident, radiant smile that you will love to show off. Request an appointment to discuss achieving your brightest, most beautiful smile. Many adults are unhappy with their misshaped or crooked teeth and believe that the only solution is to spend a lot of time wearing braces. Improved materials and technology, however, have now made it possible for your dentist to repair crooked, crowded, and even missing teeth and give you a beautiful smile without spending a lot of time on orthodontic treatments. Furthermore, cosmetic dentistry is no longer just restricted to front teeth. If you have old-fashioned silver fillings in your back teeth that make you feel uncomfortable about showing off a wide smile, you can now replace those fillings with state-of-the-art materials that will give you a more attractive smile. Even better, new technology can help to make your teeth stronger and healthier, ensuring you keep that beautiful smile for longer. Is your smile all you want it to be? If you can identify with any of the following statements, then you can benefit from one of our cosmetic dentistry procedures. We will be happy to answer your questions and show you how easy it is to create a beautiful new smile. I would like to have a nicer smile. My teeth are stained or discolored. I have dark and unsightly fillings. My teeth are crowded and crooked. My gums are red, swollen, receding, and/or bleeding. I don’t like the spaces between my teeth. I have old unsightly crowns with black lines. My teeth are chipped and worn with rough edges. I cover my mouth when I smile. My teeth seem out of proportion. Certain foods and beverages, smoking, and medications can all play a role in the staining and yellowing of teeth. Over time, this can actually age your appearance. Our teeth whitening services include bleaching your teeth during an in-office treatment, or we can provide a teeth whitening system you can use at home at your convenience. The latest whitening systems make it possible to brighten and whiten your teeth as much as 10 shades within just an hour without damaging the enamel of your teeth. Bonding may be the ideal solution if you have chipped or discolored teeth. In the bonding process, we will shape composite resin to change the color and shape of teeth as well as close in any gaps between your teeth. We can usually complete this procedure within one office visit. If you have stained, crooked, or poorly shaped teeth, porcelain veneers could be just the solution you need. 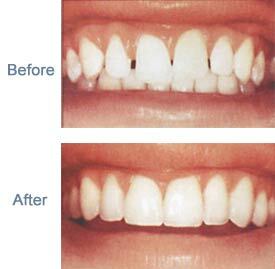 Veneers can also be used for covering chipped teeth and other imperfections. This procedure involves removing a small amount of enamel, as necessary, and taking an impression of your teeth. Next, a thin veneer is custom made for your teeth and applied. This procedure is completely painless, so no anesthetic is required. Crowns are designed to provide protection to weak teeth, restore broken teeth, cover poorly formed or discolored teeth, and cover dental implants. A crown made be made from metal, porcelain, or metal fused to ceramic or metal materials. Permanent crowns typically require multiple office visits, but we are pleased to offer CEREC® ceramic dental restorations. This type of restoration can be performed within a single visit. Crowns typically last anywhere between five to 15 years, based on the amount of wear and tear as well as your oral habits. You may be a good candidate for shaping and contouring services, if you only have minor defects in otherwise healthy teeth and you have good bone support. Shaping and contouring services can help to restore slightly overlapped teeth and small chips in your teeth. Additionally, shaping and contouring can also be used for improving the look of excessively pointed cuspids. A bridge may be a good solution when you are missing one or more teeth. Bridges are comprised of gold, alloys, or porcelain. In some instances, a combination of materials may be used. A bridge is made up of two crowns along with a false tooth to cover the gap between those two teeth. Not only can a bridge improve the look of your smile, but it can also be useful for preventing your remaining teeth from becoming improperly aligned. Also sometimes referred to as indirect fillings, this procedure involves the use of composite or porcelain materials that provide a filling for teeth damaged by tooth decay or other forms of structural damage. While dental fillings are actually molded into place, inlays and onlays are created first before being fitted into the teeth by your dentist using an adhesive bonding. Used to compensate for tooth loss, dental implants are comprised of artificial tooth replacements. These prosthetics can be used to provide a greatly enhanced smile while also often giving you a more youth appearance by preventing the face from collapsing due to tooth loss, thus making you look older. If you’re not sure which types of cosmetic dentistry services you may require, let us assess your smile and make recommendations to improve the overall appearance of your smile. One or more cosmetic dentistry services can be used to give you a more confident and beautiful smile. We are pleased to offer a wide range of family cosmetic dentistry services. It is never too late to set the stage for a healthy, beautiful smile. Your smile is one of the first things people notice about you. There is no need to hide your smile or feel embarrassed about it. With our family cosmetic dentistry services, you can be proud of your smile while enjoying the healthy benefits of stronger teeth. If you are unhappy with your smile, we encourage you to find out more about our cosmetic dentistry services and the various treatments available.